February 26, 2019.- María Isaura Cuaran, an indigenous Siona woman, is displaying a rash that has appeared at the base of her neck. It is barely visible, but there nonetheless. Pulling her turquoise top off her left shoulder and tugging down on her bead necklace, Cuaran talks about “the company” and how, she alleges, it has affected the local river. Sitting next to Cuaran is Marleni Piaguaye. The two women appeared equally agitated, equally desperate to talk. Piaguaye is wearing a red London T-shirt with Big Ben and the union jack on it. This is somewhat ironic, given where “the company” is from. Between them, Cuaran and Piaguaye have seven children. They form two families living in the tiny village of Puerto Silencio, in the north-east of a roughly 4,500-hectare (11,100-acre) Siona reserve called Buenavista, deep in the Colombian Amazon along the border with Ecuador. Buenavista is the largest in geographic terms of six Siona reserves and home to approximately 600 people. Running past the village is the Piñuña Blanco River, which flows into the Putumayo, itself in turn a major tributary of the mighty Amazon. In Puerto Silencio, like across the vast majority of the rural Amazon, the local river is the main source of water – for drinking, cooking, bathing, swimming, and washing clothes and utensils. How has the Piñuña Blanco changed in recent years? Bathing and swimming remain a serious problem. Piaguaye says over the years she and her family have sometimes been able to use another water source, in addition to the Piñuña Blanco. But other families, like Cuaran’s, haven’t been so fortunate. Given the alleged contamination, 15 rainwater harvesting systems were recently installed in the village by two NGOs: the indigenous-run, Ecuador-based Ceibo Alliance and the international Amazon Frontlines. Both Cuaran and Piaguaye, like many others in Puerto Silencio, are adamant they know who is responsible: the Colombian subsidiary of the UK-based company Amerisur Resources, which reportedly began exploiting oil in a concession called Platanillo, just to the west of Buenavista’s reserve, a decade ago. Among other things, the women allege that the company was using a tube to dump untreated – or inadequately treated – production wastewater into a stream called the Mansoya River, which ultimately feeds into the Piñuña Blanco. They say they have seen that tube for themselves. Permission to dump into the Mansoya was granted by Colombia’s ministry of environment in 2009. Is there any scientific evidence for the women’s allegations? Colombia’s national authority of environmental licences (ANLA) visited the authorised dumping point on the Mansoya last year and found no observable “impact on the water, soil or vegetation”, noting in a report that there was no longer any infrastructure to dump, that Amerisur claimed it had not done so since 2012, and that in 2015 the company was granted permission to reinject waste water into the ground instead. However, according to the Siona, no samples were taken where they requested and no results of samples that may have been taken elsewhere have ever been sent to them, despite numerous requests. The Piñuña Blanco isn’t the only body of water the Siona in Buenavista allege Amerisur has affected. According to a report issued in August 2017 after a visit to the reserve by numerous government agencies, wastewaters from Platanillo had not been treated adequately and had contaminated wetlands, rivers and/or streams, including the Mansoya, Singuiyá and Peneya. According to the Siona, the company has also dumped poorly treated wastewaters directly into the Putumayo. They say this sparked outrage in Buenavista as well as in the nearby village of La Rosa. The ministry of environment also granted permission to dump wastewaters into the Putumayo River in 2011. Buenavista’s spokesman, Mario Erazo Yaiguaje, showed the Guardian the tube running through the forest that was allegedly used to do it. Some of it has now been cut away – apparently for scrap metal. Like on the Mansoya, the ANLA reportedly visited the dumping point on the Putumayo last year and found no environmental effects, again noting that permission to reinject was granted in 2015, that there is no longer any functioning infrastructure to dump there, and that Amerisur should dismantle the now-fragmented tube. The ANLA also claimed to have travelled from La Rosa downriver to Buenavista and identified no effects there either. Amerisur denies allegations of contaminating the Putumayo too. “[The company] complies with the environmental regulations under which its operations are governed,” a spokesperson said. “All potential contaminants are removed above and beyond the requirements before the disposal of the treated water, a process which is allowed under the environmental licence. Platanillo extends for more than 11,100 hectares, but because of the way the rivers run, it potentially affects an area far larger than that. “The situation has been fully explained to the community of Buenavista during the socialisation processes that [was] carried out, not just by the company but by the government agencies involved. However, persistent unfounded claims continue to be made, which ignore both the facts and the results obtained by the regular legal and environmental audits by ANLA and Corpoamazonía. In all the many water disposal audits which have taken place, Amerisur has never been sanctioned,” the company spokesperson said. As explored in part one of this series, over the last few decades the Siona – numbering roughly 2,600 in total – have found themselves tragically caught up in Colombia’s armed conflict, together with the US’s so-called “wars” on both drugs and terror “. Ten years ago the country’s constitutional court declared them “in danger of being physically and culturally exterminated”, a concern it reiterated in June 2017. Although fighting between the government and the country’s largest guerrilla group, the Fuerzas Armadas Revolucionarias de Colombia-Ejército del Pueblo (the Farc), officially ended in 2016 with a historic peace deal, in Putumayo, as elsewhere, conflict continues, albeit in a slightly different form. According to the Inter-American Commission on Human Rights in July last year, paramilitaries, “narco-paramilitaries”, “dissident Farc organisations” and “armed soldiers” are still fighting. Under the inter-American human rights system, the commission has issued what it calls “precautionary measures” and urged Colombia’s government to take the “necessary steps to protect the lives and personal integrity” of leaders and their families in Buenavista and one other Siona reserve, Santa Cruz de Piñuña Blanco. To date however, the government has taken no concrete action, as the Siona and various civil society organisations told the commission at a hearing in Bolivia on 12 February. Buenavista has been locked in a fierce struggle with Amerisur for several years. According to its 2017 annual report, the company first became the operator at Platanillo in 2008. It is one of numerous concessions in Colombia’s Putumayo basin where Amerisur now operates or has working interests. Numerous issues are at stake. One is a proposal by Amerisur to expand its operations by exploring for oil in a concession immediately east of Platanillo, called Putumayo-12, which entirely overlaps Buenavista’s reserve, as well as a huge swathe of land into which the community is trying to expand the reserve under a government land restitution programme. This is the subject of part three of this series. 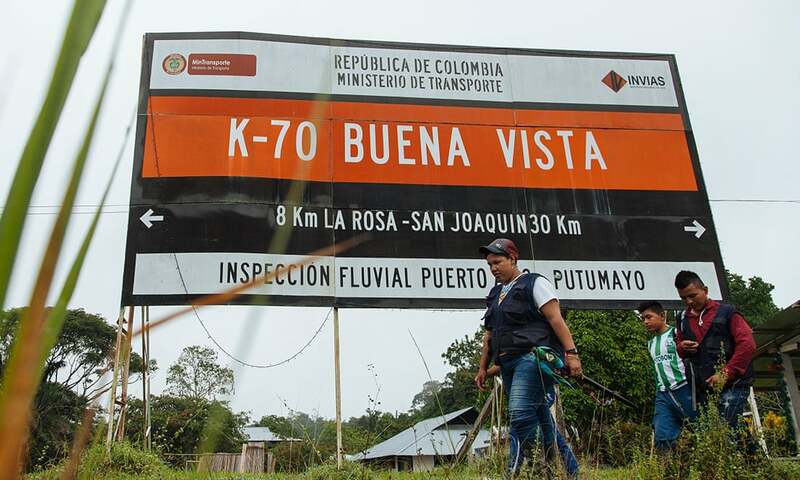 Another is the alleged social and environmental concerns regarding a recently built pipeline, the Oleoducto Binacional Amerisur, which crosses the border into Ecuador and has prompted Siona from the village of San José de Wisuya, on the opposite bank of the Putumayo from Buenavista, to take legal action and make formal complaints to Ecuador’s ministry of environment and Defensoría del Pueblo. A third is similar alleged concerns – such as Cuaran’s and Piaguaye’s – regarding operations in Platanillo. It is for some years now that the Siona have been alleging that the Piñuña Blanco, among others, has been contaminated, to others in civil society, to the media, to the government. According to Cuaran and Piaguaye, the same kinds of health effects that they have reported to the Guardian were communicated to health ministry representatives during a rare visit to Puerto Silencio in 2017, but they heard nothing back. “They’ve come here and we’ve spoken, but they’re ignoring us,” one of the women says. “Yes, they’ve come and asked the same questions as you, but until now [no response],” says the other. Ricardo Amortegui, the head of communications at the ministry of health, said he would inquire about following up the 2017 visit and acknowledged the Siona’s “difficult situation” – the consequence of what he called “river contamination by oil operations and health impacts”. The Siona in Buenavista are continuing to insist that the ANLA, in full coordination with community leaders, visit their territory to “verify the social and environmental impacts”. At the Bogota meeting in December, ANLA personnel reportedly said that ANLA had visited Buenavista in 2018 and “didn’t confirm the allegations made by the Siona at the points they had identified”, according to a Defensoría del Pueblo record of the meeting. However, that same record cited a Siona leader or leaders replying that the 2018 ANLA visit had been made without their knowledge or participation, and didn’t include the places which they have been alleging, since 2012, have been affected. The December meeting ended with ANLA personnel promising, in the first week of January this year, to schedule a visit to the places identified by the Siona in the first half of 2019. The Defensoría is committing to coordinating the visit. The ANLA said it has been scheduled for May. Buenavista’s lawyer, Lina María Espinosa Villegas, believes it is “fundamental” that the visit goes ahead.